Home > News > Blue Knights® Intl LEMC, Nebraska Chapter II Members Continue to Shine! 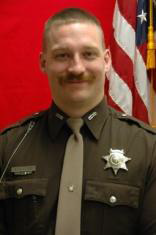 Cass County Deputy Jesse Godden and Nebraska Chapter II member was selected amongst a department of highly motivated Cass County Deputies as this Month’s Road Division Employee of the Month. Deputy Godden is currently assigned to the road patrol Division. Selection as employee of the month is a tough competition and is based on Attitude, Dependability, Punctuality, Leadership, Performance, and Communication. Congratulations Deputy Godden, your efforts to better yourself while protected and server your community reflect great credit on you and your family, your department, and of course The Blue Knights!